An invaluable test kit which enables you to easily and reliably determine the microbial quality of fuels, including aviation fuel, marine diesels, automotive diesels, gasoline and biofuels. The test is recommended for monitoring fuel storage and distribution systems and end user fuel and oil tanks for microbial growth. The product is supplied in Packs of 5 and Packs of 50, and the relevant Product Codes for each are displayed on the right. MicrobMonitor®2 enables testing in accordance with globally recognized standards, listed by industry bodies (like IATA and the aviation Joint Inspection Group), OEMs (like Boeing and Airbus), and used by many of the world’s biggest users and producers of fuel. Anyone can easily use the kit, by adding a small amount of fuel to the glass bottle of specially formulated testing gel. MicrobMonitor®2 has been validated by independent studies (conducted by the Energy Institute), and is recognized as both an International Petroleum (IP) and ASTM standard test method (IP 613 and ASTM D7978 respectively). The test detects very low levels of contamination by all three types of microbes (yeast, bacteria and mould) which cause microbial contamination of fuel and oil. This enables early detection, before the contamination becomes a problem. The test will also detect spores of microbes, which are often the only indication of contamination in a system. "We have been supplying MM2 since its launch in 2002 and have never had any issues regarding the performance of the test kit or the quality of service received from ECHA." "ECHA Microbiology provides an excellent service to us. We are located in Chile, South America but it doesn't matter cause the delivery time is good and it has always been met. Your products never fail. Thanks!" "MicrobMonitor2 is a high quality product, complete with excellent back up from a professional Customer Service Department." A small glass bottle containing a thixotropic nutritive gel formulated specifically to grow microbes associated with fuel and oil spoilage. Sold in boxes of five and forty four tests with sterile devices for measuring and dispensing fuel, oil and water samples. What is the HS code of the MicrobMonitor2 test? 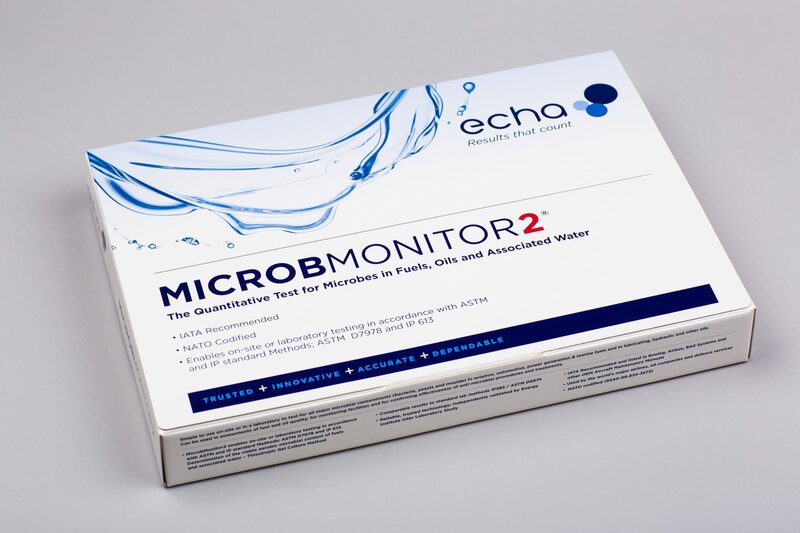 MicrobMonitor2 is classified as: Prepared culture media for the development or maintenance of micro-organisms HS: 38.21.00.00 for export and HS 38.21.00.00.00 for import. Routine condition monitoring as part of a good housekeeping regime can significantly improve asset utilisation and reduce operational risks. Filter plugging, blocking of fuel and oil lines and injectors causing excessive wear and failure. ANYONE – full instructions are supplied and no special skills or equipment are needed. Can I use the MicrobMonitor2® test for all types of fuel? Yes. The recommended volume to test may be different though. MicrobMonitor2® can also be used to test lubes. Start with frequent testing (every month for example) and adjust testing intervals according to operational experience and the perceived risk. Is the MicrobMonitor2® test the only test kit I need? It is for aircraft tanks as these are well aerated (aerobic), but fuel storage tanks are often partly stagnant, and corrosive ‘anaerobic’ Sulphate Reducing Bacteria can grow. The Sig Sulphide test will enable you to detect SRB. MicrobMonitor2® was developed originally for use in the aviation industry for testing jet fuel and is recommended by IATA and listed in the Aircraft Maintenance Manuals of Boeing, Airbus and other major aircraft OEMs. Major airlines have been using the test for many years. MicrobMonitor2® has been independently validated in an inter-laboratory study conducted for the Energy Institute and enables testing in accordance with IP Standard Method IP 613 Determination of the viable aerobic microbial content of fuels and associated water – Thixotropic Gel Culture Method. The test also gives results comparable with laboratory standard test methods IP 385 and ASTM 6974-03. What's the easiest way to break up the gel? 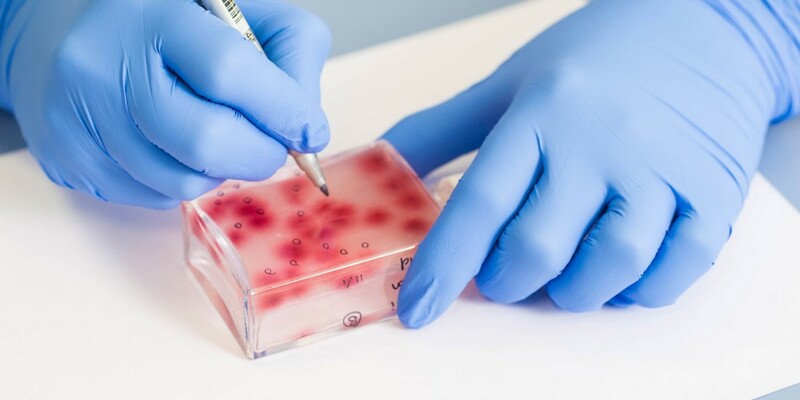 It is important to break up the gel in the Microbmonitor2® test and shake thoroughly (30 seconds recommended) to disperse the sample in the gel. Inadequate shaking can result in lumpy gel and can result in patchy growth which can make test results more difficult to read and interpret. Tap the bottle sharply several times (in the palm of your hand) to break up the gel before you shake it. Some users tap the bottle several times on a large rubber bung. Other users warm the tests to about 30°C (86°F) before use; this makes the gels easier to shake. We now supply MicrobMonitor® Bumpers for those who need to shake lots of tests. When I use the test a pink/peach colour develops in all of the gel. Is this microbial growth? Possibly not – The stability of fuels and lubes, particularly those formulated with bio-ingredients, is often improved by the suppliers by adding anti-oxidants. These can react chemically with one of the ingredients of the MicrobMonitor2® test, resulting in a pink/peach background colour. This usually occurs within 24 hours and does not interfere with the growth of microbes transferred from the sample. Their growth produces deep red colonies in the gel which can easily be seen despite the pink background. To reduce the effect you can test smaller volumes of sample, for example 0.1 ml of bio-diesel instead of 0.25 ml. Then use the 0.1 ml section of the interpretative chart. I sometimes see red patches or streaks in the test. How do I interpret this? Some bacteria are very motile and they can swim in the test gel to form large purple or red patches or streaks. The patches often have uneven colour intensity. Usually the problem only occurs when testing water samples or fuel samples containing suspended free water. • Look at the test after 1 or 2 days, before the patch has spread out; count the colonies marking them with a felt pen. If when observed again (e.g. at 4 days), a spreading patch is present, this should be ignored and only new normal colonies counted and added to the total count. • If it was not possible to observe the test before the patch spread, it is often possible to see through the patch and distinguish and count normal colonies as usual. The patch tends to have a lighter colour intensity than normal colonies and is not clearly demarcated. Each patch should be counted as one colony and added to the total count of normal colonies. If it is difficult to determine where a patch begins and ends, record a count of “1” colony for the patch or streak and add this to the total count of normal colonies. • If it is not possible to distinguish and count normal colonies through the patch, count only an area of the gel which is not affected and multiply the count by an appropriate factor for the final result (e.g. count half of the gel area and multiply by 2). • If using the interpretation chart to estimate the total number of colonies, try to ignore the patch and estimate only on the number of normal colonies; if necessary estimate the intensity of colonies based on an area of gel which is unaffected by the patch. • If none of the above are possible, it may be necessary to repeat the test taking the avoidance precautions described below. You may also send a photograph of any unusual results to info@echamicrobiology.com and we will do our best to interpret the result for you. • If you are testing water, you can reduce the chances of getting spreading bacteria and improve the ability to discern individual colonies by testing only 0.01 ml volumes of water using the dispenser provided. 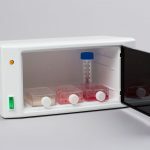 • Use an incubator to keep the temperature constant and reduce condensation on the gel. • Shake the test properly after adding the sample. Streaky or patchy growth in the test is more difficult to interpret if the gel is not properly shaken and the gel remains lumpy. Always ensure the gel is properly broken up and then shaken with sample for 30 seconds. Are the limit values for different levels of microbial contamination regulatory or standardised? There are no microbiological standards in any fuel specification and the limit values suggested can be changed according to the local perceived risk and local operating experience. Large oil companies and major fuel users often have their own in-house limit values. MicrobMonitor2® is available in packs of 5 tests. 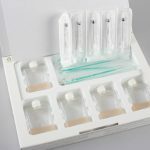 The normal packs include all that is needed to conduct the test including sterile syringes and loop dispensers for measuring sample into the test. For users who have their own sterile measuring devices, a bulk pack is also available which does not include syringes or loop dispensers (nor chlorine release tablets). Syringes, loop dispensers and chlorine tablets can be purchased separately as required. If I use a biocide in my fuel, will the MicrobMonitor2® test detect survivors? Yes, unlike some other tests, MicrobMonitor2® can be used immediately after biocide treatment to check that the treatment has worked (you will still need to allow for a soak time of 24 hours before testing). I have found ‘moderate’ or ‘heavy’ microbial contamination according to the IATA ‘Guidance Material’ limit values. When I enter the tank I find little evidence of microbial growth. Are the limit values wrong or am I interpreting the results wrongly? The ‘moderate’ and ‘heavy’ contamination limits as defined by IATA and repeated in OEM’s manuals, are set at levels which enable corrective treatment with a biocide or cleaning + biocide, before there is an operational problem. They do not necessarily mean that the fuel is unfit for use at that time. When I test both water and fuel phases from an aircraft or fuel storage tank I sometimes find that the fuel is heavily contaminated but the water is clean. How do I interpret this? This probably means that that the fuel uplifted or imported is heavily contaminated and the growth is not taking place in your tank. When I test both water and fuel phases from an aircraft or fuel storage tank I sometimes find that the water is heavily contaminated but the fuel is clean. How do I interpret this? This probably means that that dirty sea water, wash water or environmental water has entered the tank. Drain it off as soon as possible before the microbes adapt to grow in your tank. Can I store MicrobMonitor2® in the refrigerator? Yes – This will extend the shelf life to about 2 years. If you store your MicrobMonitor2® tests in the refrigerator, take the number you intend to use out of the refrigerator in sufficient time before you use them for them to regain ambient temperature. Keep them in the dark of course. Return unused tests to the refrigerator. Can I store MicrobMonitor2® in the freezer? MicrobMonitor2® may be frozen for short periods e.g. during transport. However we do not recommend long term frozen storage as the properties of the test will change after several weeks. How do I dispose of MicrobMonitor2® tests after use? Tests showing any positive results contain microorganisms and should be handled carefully. Avoid touching the inside of the bottle or cap. 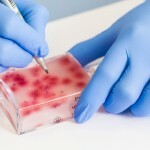 Dispose of used tests showing microbial growth by incinceration, or by disinfection followed by disposal. Wash your hands and work surface after disposal with antibacterial soap. Disinfection of used tests can be accomplished by careful addition to each test bottle of two of the “Aqua Tabs” provided with the kits (where available). Recap the bottle and shake vigorously for 30 seconds then leave for 24 hours. Alternatively used kits can be sterilized by immersion open in a solution of strong disinfectant overnight. After sterilization, bottles should be disposed of in accordance with local waste disposal regulations. What is the maximum temperature I can test or incubate at? MicrobMonitor2® tests will become increasingly more fluid at temperatures above 40°C. Therefore incubation above this temperature is not recommended as the developing microbial colonies are not likely to remain as discrete during growth.